EAST VILLAGE — Volunteers painted to the town white Monday as part of an initiative to reduce energy consumption. Twenty rooftops along East Fourth and East Third streets were busy being covered in a reflective white coating as a way to cut cooling costs and conserve electricity. 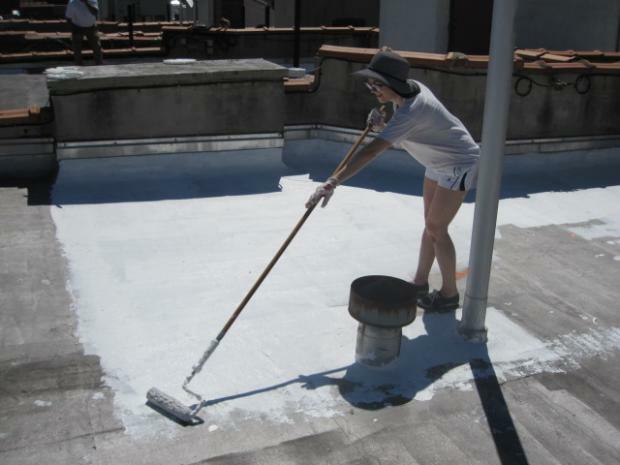 The project, a partnership between Borough President Scott Stringer and a host of local community groups, seeks to limit energy usage by painting rooftops white instead of the heat-attracting tar beaches that top many buildings. "This is how we transform the city," Stringer said at an event with neighbors to describe the project's impact. Roofs represent 12 percent of all surfaces citywide, Stringer said, noting that temperatures in the city would drop 2 percent if all rooftops were painted white. Local affordable housing group the Cooper Square Mutual Housing Association — working in partnership with Go Green! Lower East Side, the White Roof Project and Fourth Arts Block — used its properties for the "model block" initiative. With its dense population and abundance of roofs and blacktop, the Lower East Side has been identified as the hottest neighborhood in Manhattan, said White Roof Project executive director Heather James. Additionally, the area's energy consumption puts more stress on the city than any other neighborhood in the entire state, she said. "I'm glad that this movement can be said to have started on the Lower East Side," said Cooper Square Mutual Housing Association executive director Val Orselli, whose company manages 377 residential apartments. Similar inititatives have been undertaken in East Harlem, Washington Heights and Inwood, officials said.